Supporting College Matriculation and Graduation: Potential high-impact, scalable programs that dramatically increase the pipeline of high school students on a path to complete two and four-year college degrees. 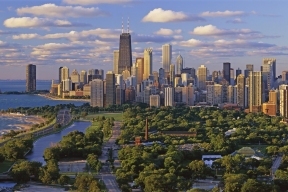 Re-engaging Youth in Work and School: Potential high-impact scalable programs that target “Opportunity Youth,” 16-24 year olds who are disconnected from both work and school and who are living in neighborhoods most impacted by violence. Programs should be designed to prevent involvement in violence by providing paid employment, workforce skill development, and/or educational re-engagement. 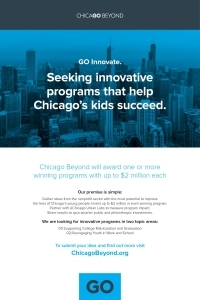 Please visit ChicagoBeyond.org for information on GO Innovate. Letters of interest are due April 29, 2016.